Grundfos Booster Pump | Do Hot Water Recirculating Systems Work? 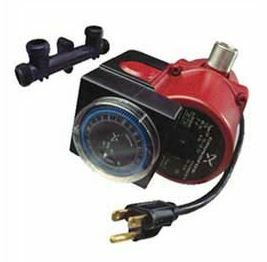 The Grundfos pump kit or pretty much any whole-house-hot-water-recirculating system consists of two hardware pieces: Booster pump with built-in, 24-hour timer; 3-prong electrical power cord, and a hot-cold water union. The Grundfos booster pump is installed by the hot water heater , itself. The additional union hardware (known as a comfort valve) is installed between the hot and cold water outputs and faucet fittings of the sink which is farthest away from your hot water heater. The reason for this fitting is to make hot water instantly available at all fixtures. You can see a more detailed, specific explanation here: Grundfos Circulation Pump. This all sounds good in theory, but how well does it work? I’ll give you the results of my own experience over the last year. How well does a Hot Water Recirculating System Work? My hope was that the Grundfos hot water recirculating system would get hot water to all fixtures of my house instantly. My biggest desire and need was to get instant hot-water from the kitchen faucet in the mornings. After the Grundfos booster pump was installed, I was still not getting instant hot water to the kitchen sink. My time was reduced from 1:20 seconds in the morning to about 35 seconds. This is a big improvement, but hardly instant. The one place I do get instant hot water is my bathroom sink where the union comfort valve was installed. Here-in lies my biggest complaint with the whole system. I am no longer able to get cold drinking water from my bathroom sink without running the water for about 20-30 seconds. This sort of defeats the entire purpose of a hot water circulation system, doesn’t it? 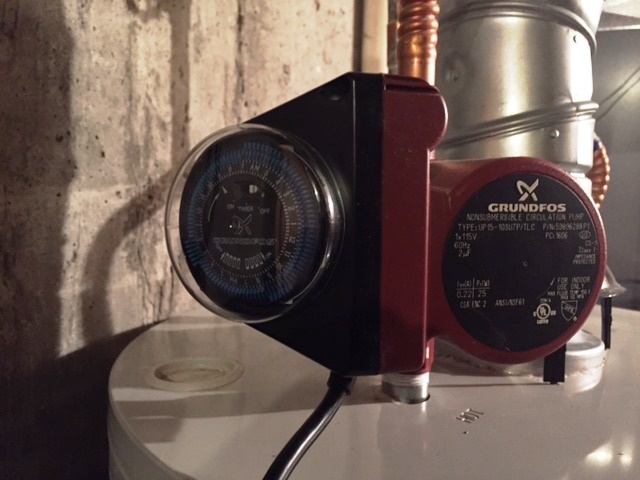 When weighing the pros and cons of getting instant hot water to my bathroom sink versus still not getting instant water to the kitchen sink versus having to waste water to get cold drinking water from my bathroom sink, I would not buy a Grundfos Booster Pump or water circulation pump if I had to do it all over again. A plumber informed me that I could swap the comfort valve union with another upstairs sink in the house, but I would only be trading problems with another household member. To tell you the truth, I am torn between removing the entire system or leaving it as is. I did give the Grundfos comfort system one-star because I can see how it might work better for some households with different plumbing systems. If you own a Grundfos booster pump like this please leave us your own rating based on your own experience. If you have another type or kind of hot water circulation system please leave your comments below.